POLITICAL TIDBITS: How true is allegation that Napoles advanced cash for DAP payments at CJ Corona’s Senate trial? 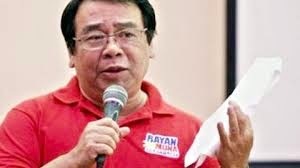 Bayan Muna Rep. Neri Colmenares warns that far from abolished, PDAF is alive and kicking in new P2.6T national budget for 2014, in the form of unspecified lump sums, echoed by former Nat. Treasurer Leonor Briones.Three SC justices steadfast on DAP as unconstitutional. Brillantes complains about DBM’s sudden offer of recall funds in case of LP’s Edward Hagedorn vs. Mayor Lucilo Bayron. Butch Belgica, the 2014 national budget is still to be submitted in time for the opening of Congress on the last Monday of July. We all should watch out for disguised PDAFs there, in the form of unspecified lump sums. Supreme Court: All Pork Barrels- of both presidential and congressional - Unconstitutional. Thus, Illegal. SC directs to investigate ALL. So, Notices of Disallowance should be issued to ALL these illegal pork transactions (cdf/pdaf, insertions, malampaya funds on non-energy, presidential social funds from Pagcor and PCSO) of past and present administrations.